The recent student protests, which have their roots in issues at the Faculty of Humanities, have opened the door for a discussion about much broader and more fundamental problems in the university. These problems can only be resolved by decentralizing and (re-)democratizing. Rethink UvA is committed to addressing these issues. The following short statement outlines our position. 1. Diagnosis: What’s the problem? 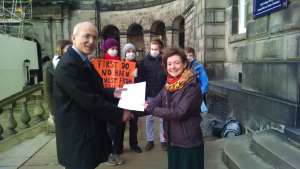 Today we handed in our open staff letter to the Senior Vice Principal and Chair of the fossil fuel divestment review group, Professor Charlie Jeffery. 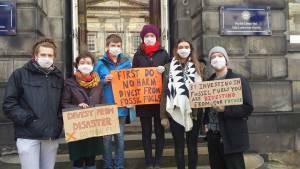 Signed by over 50 members of staff and academics at the university, it sends out a clear message of support for divestment from fossil fuels and arms. As the last fossil fuel review group meets, we call on them to listen to staff and students who are sending a strong message to remove investments from industries who are fueling environmental damage and social injustice.